When the twenty-second edition of the Badminton World Championships begins on Monday, Indians will have more to cheer than they have ever in the past. This time around, India enters the annual event with around half a dozen of the eighteen member team being strong contenders in their respective sections. For the historical perspective, India has won four bronze medals at the event, with all being bronze. Prakash Padukone was the first with his 1983 medal followed by Jwala Gutta Ashwini Ponnappa in 2011 and PV Sindhu bagging two in the last two editions. The squad comprises of a mixture of experienced players and aspiring newcomers. After all the success in singles, the contrasting fortunes of our doubles players is often highlighted as the weak point in Indian badminton. Recent months, though, have given news enough to allay such fears. One is the appointment of Malaysian Tan Kim Her as the doubles coach, a spot that had fallen vacant for some time following Indonesian Edwin Iriwan’s exit in 2013. The other good news is the recent performances of our doubles players. Of them, the duos of Jwala Gutta-Ashwini Ponnappa and Manu Attri-Sumeeth Reddy have raised the hopes of many. With their exploits earning them career high rankings of No.12 and No.17 in the world respectively, the clout for doubles players has increased significantly. With both the teams currently well posited to earn a Rio berth, the World championships will provide them an opportunity to grab some valuable points as the event offers the highest among BWF tournaments. It is too early to think of Rio berths, but both these teams have made the most in the first few months that count for the cutoff rankings. Manu Attri and Sumeeth Reddy have managed successful purges of some higher ranked teams in the one last year, beginning with the upset of fifteenth seeded Hirokatsu Hashimoto and Noriyasu Hirata in the World championships last year. The Japanese faced another defeat at this year’s US Grand Prix Gold event and are drawn to meet the Indians in the second round. They then followed it up with wins over top ranked players from Denmark, Japan, Poland and even wins over two Chinese teams at the Asian Games and the All England Championships. Their recent performances have also seen improvement with them winning the Lagos International tournament, reaching the finals of the US Grand Prix Gold and the semi-finals of the recently concluded Russian Grand Prix. By virtue of these results, they stand at the seventeenth position, their career best, in the rankings as of now. They open their campaign against the Chinese team of Cai Yun and Lu Kai who are ranked twenty-ninth in the world and have not faced the Indians. Facing a Chinese pair in the very first round is a difficult proposition. Though the Indians are the higher ranked team and have shown the ability to win such matches in the past, it will surely be a difficult one to pull off. 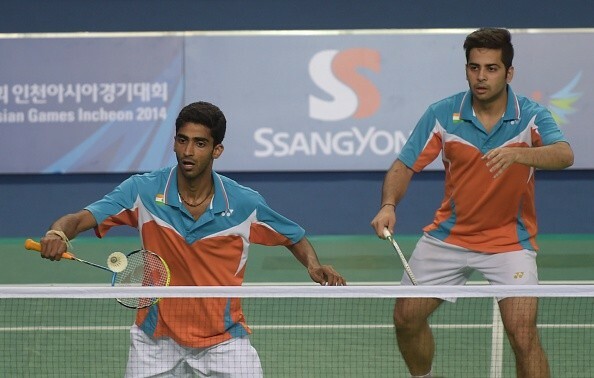 Can Manu Attri and Sumeeth Reddy continue their impressive form? If they manage to keep their unbeaten record against the Japanese, they would then face the second seeds and the former no.1 team of Danes Mathias Boe and Carsten Mogensen. The other team in is the duo of Pranav Chopra and Akshay Dewalkar. They have an easy first round against the Russian team of Nikita Khakimov and Vasily Kuznetsov before they meet the tenth seeds Mads Conrad-Petersen and Pieler Kolding in the next round. Jwala Gutta and Ashwini Ponnappa have defied odds to posit themselves as the driving force of India’s doubles team today. After earning laurels that they have made our country proud, the duo will enter this year’s Championships stronger than ever, to grab their second medal at the event. Having reached their career high ranking of no.12, they are seeded thirteenth at the event. With a first round bye and an almost easy passage into the pre-quarterfinals, they are drawn to meet the eighth seeds Reika Kakiiwa and Miyuki Maeda of Japan before a possible quarterfinals against the second-seeded Chinese pair of Luo Ying and Luo Yu. They have not managed a single win against the Chinese in three of their previous meetings. This year, the doubles pair have had many reasons to cheer. They have reached their career best ranking and have scope to improve further. They won their first title in a long time, at the Canada Open Grand Prix. More than halfway through the season, they are on course to qualify for the year-ending Super Series Finals, where the top eight performers from the Super Series events compete. They are also ahead in the Race to Rio, occupying the fourth spot currently. A medal at this event could be a tough one to ask, but the duo can certainly qualify for Rio and try to make amends there. Pradnya Gadre and Siki Reddy will be the second Indian team in Women’s doubles followed by Dhanya Nair and Mohita Sahdev. The former duo faces Isabel Herttrich and Birgit Michels of Germany before a possible second round encounter against fourteenth seeded Shizuka Matsuo and Mami Naito of Japan, while the latter faces the French team of Delphine Lansac and Emilie Lefel in their first match and if they progress, eighth seeds Reika Kakiiwa and Miyuki Maeda of Japan in the second. Gadre and currently ranked 36th, are promising and upcoming players. They teamed up after Ponnappa and Gadre split to facilitate the reunion of Gutta and Ponnappa and have since had decent success. They have five titles to their credit, including three in the last one year. With Gadre and Reddy aged 24 and 21 respectively, this might be the right time for them to rise. For the Mixed doubles event, two teams will represent India. Tarun Kona and Sikki Reddy will face Liao Min and Chen Hsiao Huan of Taiwan while Arun Vishnu and Aparna Balan face Evgenij and Evgenia Dimova of Russia in their first rounds.Though winning medals might be a tough task, these four would look to give their best to win a match or two. Can Jwala Gutta and Ashwini Ponnappa repeat their 2011 exploits?